Dishwashers can be one of the best inventions ever made. They clean dirty dishes for you and save you time standing over a kitchen sink, especially after you’ve made a big dinner when you need to deal with lots of dirty dishes, glasses and utensils. A dishwasher needs to be looked after and maintained well for it to function properly and provide you with the best dish cleaning service. 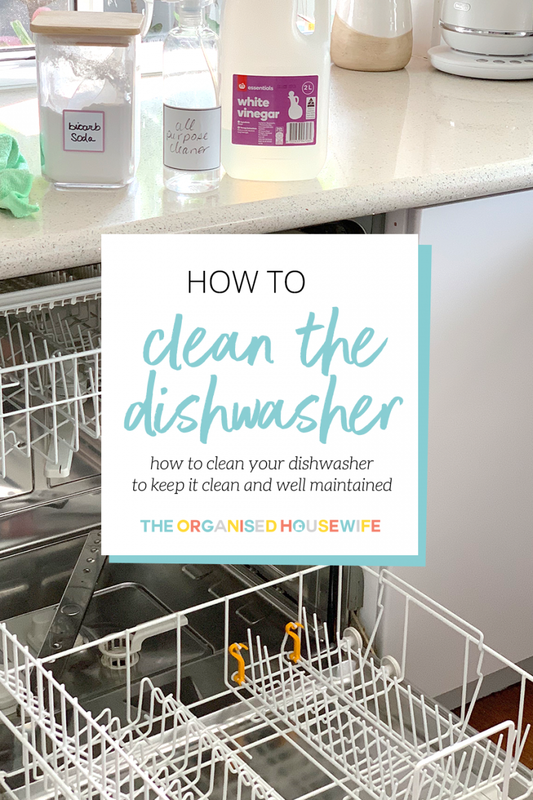 Here’s how I clean our dishwasher and keep it like new! Our dishwasher is used only once a day for three reasons. I don’t like to do dishes more than once a day, only when I have a full load as I like to conserve water. It usually cleans our breakfast dishes, dinner plates, cups, mugs and cutlery all at once. I stack the dishes into it as I go throughout the day, then put it on at night for its cycle. This gives me (or I should say the kids, as it’s one of their responsibilities) enough time in the morning to put all the dishes away and I’m ready for a brand new day. With all our daily dishes and cutlery, there isn’t enough room for much else. So the kids help with washing up frying pans, lunchboxes and drink bottles. This helps me so much because then the daily dishes all fit into the one cycle and I conserve my time and water. However, after time the dishwasher itself gets a little grotty and needs a good clean. 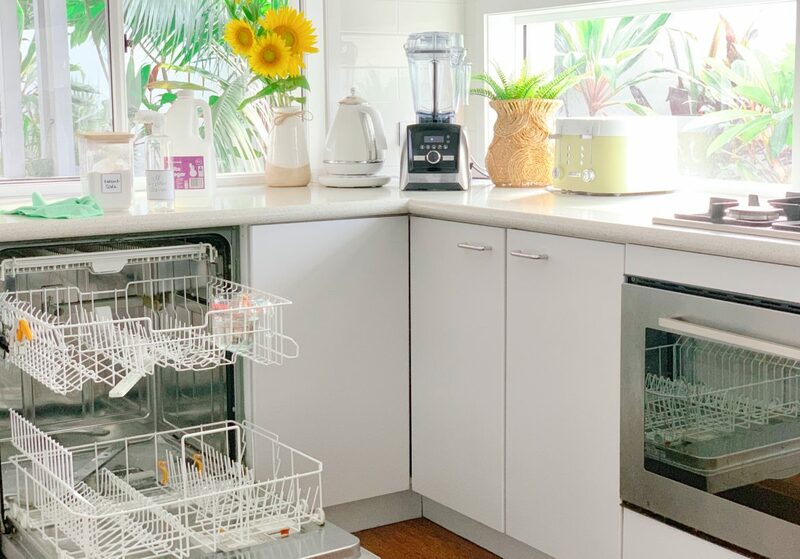 Here are some simple steps you can follow that will make your dishwasher as fresh as a daisy again! remove all dishes from your dishwasher. use all-purpose spray (this is my homemade recipe) to wipe down the inside edges of the door. spray inside your dishwasher along the base of the door (this is where I find the most gunk build up), and use a paper towel or old toothbrush to remove the gunk. for stubborn gunk, pour over some boiling water and wipe away, no need to scrub too much as it will easily wipe away after it has gone through a cycle. remove any food caught in the cutlery basket/tray. place a jug filled with vinegar (I used 1 and a half cups) on the top rack of your dishwasher. turn your dishwasher on an economy setting, using the hottest temperature and run through a cycle. once the cycle has finished, use a paper towel to ensure that all gunk is removed. Wipe down the outside of your dishwasher and any surrounding cupboards or walls that may have splatters from dirty dishes. 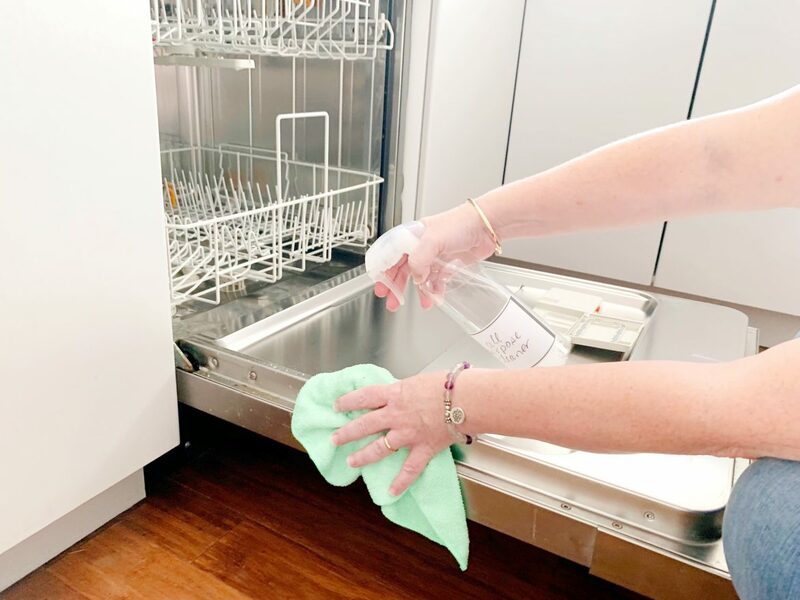 Cleaning the dishwasher with bicarb soda is so important in my household, because I need it to wash dishes up for five people every day, and I need to be able to rely on it. I also love natural cleaning products, which is why I use the bicarb soda to give it a really good clean out. Using natural ingredients for cleaning can be a wonderful and effective way to clean your home without using harsh chemicals. I really don’t like using chemicals in my home at all, unless I absolutely have to. I’ve always been careful to do the right thing for Scotty’s and my three children’s health, so natural cleaning products are my first choice now. 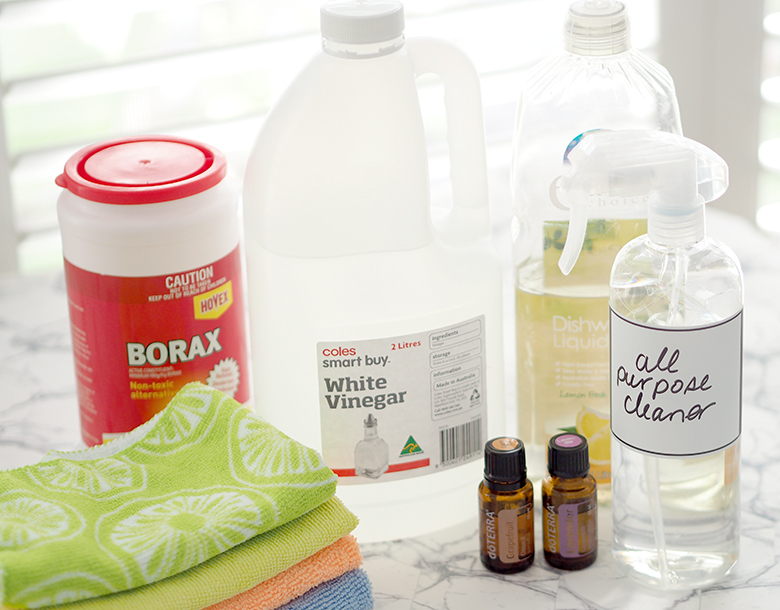 Read about how I use natural ingredients for DIY homemade cleaners. 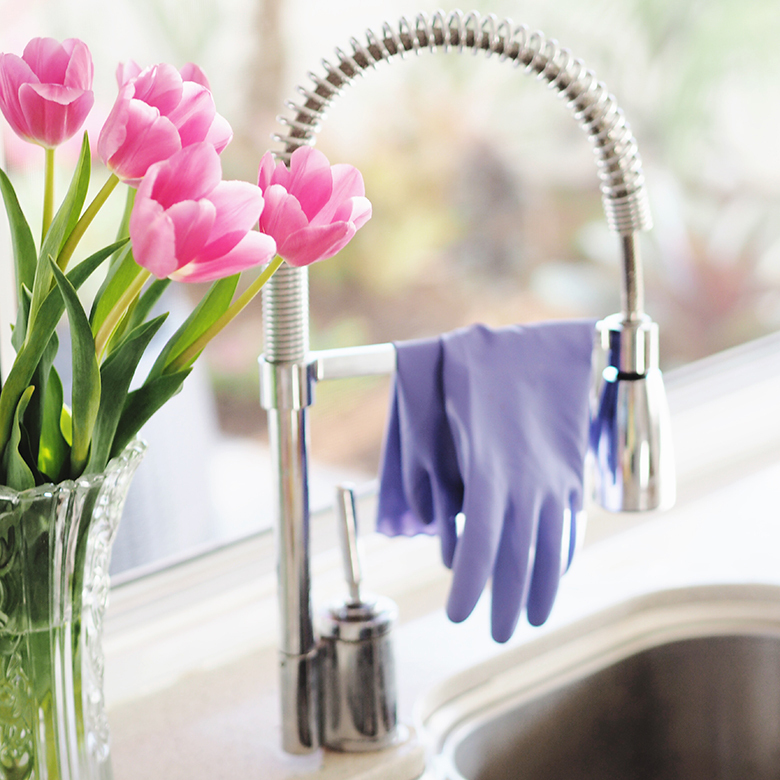 A good spring cleaning is not only good for the soul, it is also very good for your home. If you do make your own natural cleaning products, you can use them around the house to clean and freshen up all those little nooks and crannies that you’ve been avoiding to clean for some time now. 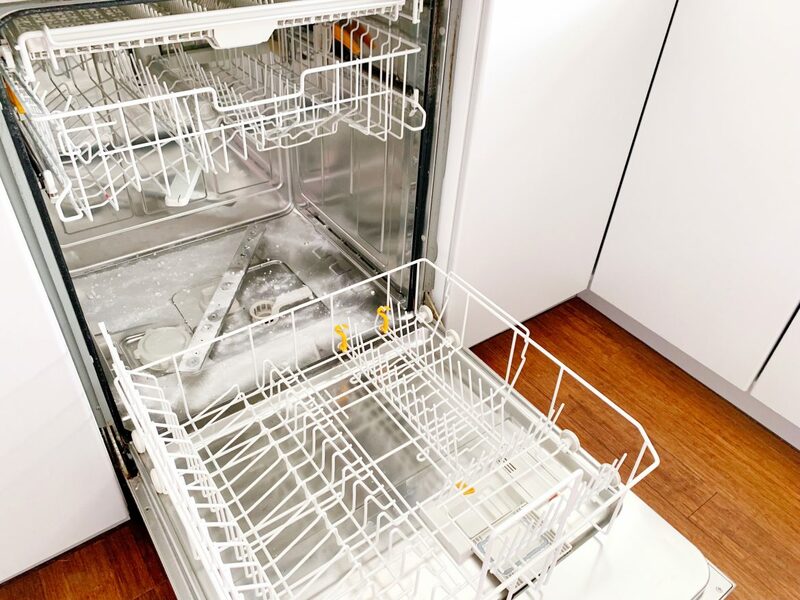 HOW DO YOU CLEAN YOUR DISHWASHER IN YOUR HOME? Ooh yeah! That gunk under the door… Get rid of that!!! My parents lived out in the country where they had minerals in the water. They would put a cup of vinegar in the rinse cycle with every load. The dishes came out spotless and the dishwasher never had any build up. This works like a charm! Yes it is the same for 2 draw dishwashers. U can actually pull them further apart and clean even more parts just remember how you got it apart so u can get it back together. Is the vinegar in the bowl meant to all spill out during the wash cycle, or just some spill out and more water collect in the bowl? Don’t forget to remove and clean the filter. Then remove the spray arms and clear any foreign bits that block the spray nozzles. How often do you recommend cleaning your dishwasher? Hi Alison,Ooh i usually try to clean mine every few weeks. Cleaning the filter is the nastiest thing ever. Needs to be done though. Thankyou so much for this dishwasher tip! For years I have done this by hand, dismantling and scrubbing etc (a very messy job) because I have found none of the commercial cleaners have worked. Finally I used the jug of vinegar on the heavy duty setting and to my amazement, all clean! The filter basket was full of the gunk that collects under the cover of the pump etc and the spray arm was completely clean! and so much cheaper and healthier than the chemicals listed in the commercial dish washer cleaners! Hi Kat, I had cleaned my dishwasher a couple of times now using this method. I found at the end that the jug with vinegar is still sitting on the top shelf full. Is it supposed to empty throughout the cycle?